The Buildera CRACKMON® 224R™ economy crack-width comparator is a pocket-sized ACI 224-01 compliant crack measuring gauge for quick measurement of cracks in reinforced concrete, masonry, drywall, stucco, and other building materials and structures. Use for periodic inspection of foundations or in conjunction with long-term monitoring with CRACKMON® Structural Crack Monitors. 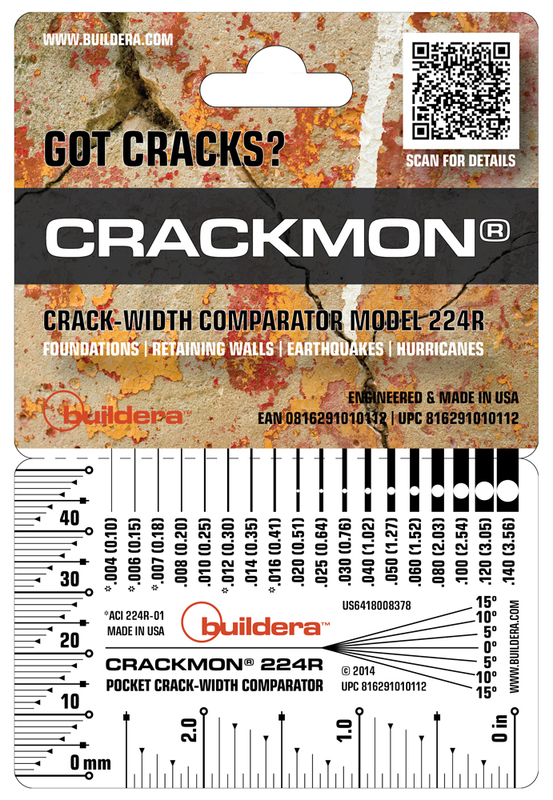 The Buildera CRACKMON® 224R™ economy crack-width comparator is a handy, pocket-sized crack measuring gauge for quick assessment of cracks in reinforced concrete, masonry, drywall, stucco, and other building materials and structures. Use for periodic inspection or in conjunction with long-term monitoring with CRACKMON® Structural Crack Monitors. Buildera™ CRACKMON® 224R™ Crack-Width Comparator. Use stand-alone or in conjunction with Buildera CRACKMON 4020A and 5020AV crack monitors. Package includes (1) CRACKMON® 224R Crack-Width Comparator, instructions and crack progress chart. Shipped in a stay-flat envelope to prevent bending during shipment. Save with bulk-packaging (50/box) for volume end-users with large field and engineering teams.